Jason McCloe and his fellow band members (Adrenaline Mob) were traveling when their RV got a flat tire. McCloe had been driving when he pulled over to fix the tire. Before he could return to the driver’s seat, he was violently struck from behind by a semi-truck. The driver of the semi-truck had fallen asleep at the wheel, and lost control of the vehicle. His semi collided with the RV and an SUV that had been traveling with the band. 22-years-old Lance Corporal Reservist Patrick Dumo witnessed the accident. He quickly pulled over and proceeded to pull McCloe from the wreckage. Due to the impact and the explosion that followed, McCloe was ejected from the RV through the front windshield. However, as the vehicle continued to roll forward, his body was slammed against the road until he eventually ended up inside the vehicle again. Based on McCloe’s report of the accident, he was attempting to escape the burning RV and collapsed. Luckily, Patrick saw him and was able to pull him from the wreckage and remove him from danger. As Patrick pulled McCloe from the wreckage a second explosion occurred, placing him dangerously close to the flames. He was able to pull McCloe to safety for approximately 75 feet. When the ambulance arrived, Patrick remained with McCloe until the paramedics could provide care. He was with McCloe, and the other band member for more than seven hours. At only 22-years-old, Patrick is attending school to pursue his education in the technology field. 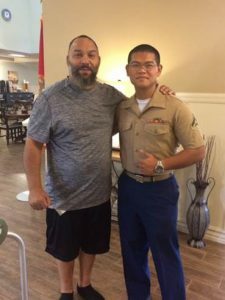 Due to being a reservist, Patrick does not have full military benefits and is trying to make ends meet by working as an aid for elderly people and being part of the Marine Corps. When Patrick came to NeuLife to visit McCloe, he was impressed by their facility and the quality of care they provide to their clients. McCloe has also been impressed with NeuLife since day one. He said everyone welcomed him, made him feel comfortable and called him by his first name. He feels his care has been outstanding. NeuLife salutes our everyday heroes, our patients. We also honor our country’s heroes for the sacrifices they make on our behalf.